John-117 being prepared for the augmentation procedures. "...the white coats coming at you with their needles and knives, their kind and serious voices. Their heartfelt belief that it's all for a good cause." Project: ASTER was the codename for the series of biochemical and biomechanical augmentation procedures applied to SPARTAN-II conscripts at the onset of puberty. The project was implemented by the Office of Naval Intelligence's Section Three under the supervision of Dr. Catherine Halsey. Human biochemical experiments and enhancement procedures have been a part of society dating back to the 20th Century; their gains have attracted widespread attention in the hopes of improving human strength and endurance. Military experimentation with such enhancements has always been limited for the sake of moral and ethical concerns. However, as technology improved and as scientists continued to understand the human body, advancements paved the way for the eventual use of body enhancement chemicals — the first bio-engineering protocol was established to help humans adjust to long duration spaceflight and different planetary environmental conditions, and subsequently for interplanetary war. The fruition of such procedures to help create a superior soldier did not solidify until the limited success of the ORION Project, which would pave the way for the success of the SPARTAN-II Program. Research on the then-named ORION Generation II augmentations began five years after the deactivation of the ORION Project. Early analysis concluded that next-generation candidates must have "more malleable, robust DNA structure and repair enzymes," this being based on the fundamental flaw of the augmentation procedures performed on the ORION soldiers. Because of the requirements, the best suitable candidates who would adapt without severe side effects were those of prepubescent age. Candidates of prepubescent age were screened based on genetic markers/SNPs that are linked to positive fitness and decreased disease incidence. The task of screening for such DNA structures was astronomical and to properly screen for correct genetic markers would require thirty-nine billion records. However, as DNA samples were covertly collected as part of the CAA's Outer Colony vaccination program, the UNSC had a rather comprehensive record of Outer Colony citizens to use for candidate selection. From 2511 until the augmentation of the SPARTAN-IIs in 2525, research continued refining and improving the chemicals to reduce failure rate. Later research proved difficult for other mental, adrenal and neural enhancement procedures to be used on the SPARTAN-IIs because of their unacceptable failure rates. Admiral Ysionris Jeromi conducted experimental procedures on bonobo chimpanzees at the request of his former student in an attempt to help reduce the failure rates and improve the regime. In the initial studies and research conducted on possible procedures, two of the proposed augmentations were rejected because of their risks and drawbacks. The first was adrenal-response enhancement, which would enhance the autonomic nervous system to better balance between sympathetic and parasympathetic function in the body's response to stress. The next was memory and cognitive enhancements; these were rejected based upon the mental instabilities that could occur. Chemical augmentations work on a molecular level by targeting molecules within the body and then altering them to begin a growth process of targeted tissues. Although the chemicals work on a molecular level, they do not work on a genetic level, as targeted mutagenesis is impossible only with chemicals. The process of augmenting the SPARTAN-IIs was divided into two parts, surgical procedures and injection procedures. Surgeries were highly risky, intensive, and required special medical talent. Their safety and effects varied substantially from subject to subject, with the benefits and risks varying with the surgeon, the surgical conditions, and the state of the patient. Chemical augmentations have their own risks dependent upon the subject's genetic background and how they adjust to the alteration of cells and molecules and to a more physical point, tissue growth. SPARTAN-IIs also underwent extensive gene therapy. Occipital Capillary Reversal Surgery is performed on the occipital lobe of the left cerebral hemisphere of the brain; the occipital lobe is the visual processing center of the brain, containing most of the anatomical region of the visual cortex. The surgeon performs a procedure on the capillaries, the smallest of the body's blood vessels, to reverse the direction of blood flow in each capillary to boost the blood flow beneath the rods and cones of the subject's retina. The rods and cones of the eye are light-sensitive receptors located in the back of the eye. Together they are able to detect movement, light and color, and relay that information back to the brain. This procedure produces a marked visual perception increase. 11% of subjects could face retinal rejection and detachment causing permanent blindness. Carbide Ceramic Ossification The candidate's bones are exposed via surgery or procedurally sequential surgeries. An advanced carbide ceramic material is grafted onto the skeletal structure to begin assimilation into the upper layers of the each individual bone. This results in the bones being virtually unbreakable. The coverage of this procedure does not exceed 3% total bone mass due to significant white blood cell necrosis: effectively, the carbide ceramic can only comprise a thin outer "shell" bonded to each bone without interfering with bone functionality as organs. 3.8% failure rate due to possible mutations and compromised bone marrow matrix integrity. In pre-and near-postpubescent adolescents, skeletal growth spurts may cause irreparable bone pulverization. Catalytic Thyroid Implant A platinum pellet is implanted in the left thyroid gland; this pellet contains a human growth hormone that is released into the body to boost growth of skeletal and muscle tissues. As the hormone is released into the body the pellet dissolves and is absorbed. The hormone targets and stimulates the growth of fast and slow twitch muscle fibers, effectively producing significant gains in muscle mass. The hormone also targets osteoblasts to help boost bone tissue formation and effectively strengthen the bone structure. 2% of subjects acquire elephantiasis. Suppressed sexual drive. Muscular Enhancement Injections In addition to the growth hormone catalyst, a protein complex is injected intramuscularly that targets the muscles' intracellular molecular machinery to help increase muscle strength and endurance. These injections target the muscles' molecules increasing the density of the connective tissues and fibers, the more visible result being the muscles quivering and contorting over one another, making connecting tendons stronger and decreasing lactase [sic] recovery time. [note 1] 5% of test subjects experience a fatal cardiac volume increase. Superconducting Fibrification of Neural Dendrites Alteration of bioeletrical nerve transduction to shielded electronic transduction. 300% increase in subject reflexes. Anecdotal evidence of marked increase in intelligence, memory, and creativity. 12% of subjects can contract Parkinson's Disease and Fletcher's Syndrome. To prepare the subject for the augmentation procedure, the subject's head is shaved and incision vectors are lasered onto the subject's body. An intravenous drip is inserted into the subject's arm, and a general anesthetic is administered to ease the subject into a state of unconsciousness. Once the subject has been sedated, he or she is transported from the pre-op wing of the facility to another area, where the surgical procedures are performed. During the occipital capillary reversal, a neurosurgeon cuts out a small space in the skull, exposing the brain. The neurosurgeon then performs a procedure to rearrange the capillaries in the occipital lobe of the left cerebral hemisphere of the brain. This redistribution of blood vessels boosts the flow of blood beneath the rods and cones of the subject's retina. Once the surgery is complete, the piece of the subject's skull that was removed in order to access the occipital lobe is repaired and the subject's head is bandaged. When the catalytic thyroid implant is inserted, surgery is performed on the thyroid gland, where an incision is made to the left thyroid gland large enough for a platinum pellet to be implanted; once done, the incision made is closed up. The growth hormone is released and progressively works its way through the body, stimulating the growth of skeletal and muscle tissue. As this takes place, muscular enhancement injections are administered throughout the subject's body to aid the previous procedure. This produces the most prolonged delay in the rest of the augmentation procedures as the subject's body begins to alter as a result of the previous procedure. If the subject has survived the changes, the final part of the augmentation is performed. The carbide ceramic ossification is performed last due to the aforementioned complications with post-grafting bone growth. This comprises of exposing the skeletal structure, removing a small layer of surface bone (no more than 3% of the bone's volume), and then bonding the carbide ceramic shell in lieu of the removed surface bone material. This bonding is likely achieved through some biochemical means to encourage natural bone integration and a tendency of the body to reattach the bone and ceramic if somehow separated. Once completed, the natural bonding of the skeleton to the ceramic layer continues while other stabilizing and therapeutic procedures are performed. Once the augmentation procedures are finished, the subject begins a long recovery process. The healing process takes anywhere from weeks to months, dependent upon each individual subject's rate of recovery. Every day the subject performs stretches, isometric exercises, light sparring drills and consumes five high-protein meals. After each meal, the subject must report to the medical bay to receive a series of vitamin and mineral injections. SPARTAN-073 experiencing the negative side-effects of augmentation, resulting in his death. Although the subject is in a state of unconsciousness during the procedure, he or she may experience excruciating pain. Physiological stress brought on by the augmentations can produce cardiac arrest, in addition to cross-chemical complications that can result in augmentation failure. Each procedure is marked by a particular type of excruciating pain. The carbide ceramic ossification is said to feel like the subject's bones are breaking, and as if their marrow is made of glass and is being shattered. The catalytic thyroid implant and muscular enhancement injections produce extraordinary pain, as if the subject's veins had been "injected with napalm"; another sensation is pulsating and the feeling of the veins being torn out of the subject's skin. The effect of the muscles increasing in density is said to feel like the entire body is on fire, mixed with the feeling of "plated glass shattering" and being worked in the subject's body. The superconducting fabrication of neural dendrites is said to feel like fire burning along the subject's spinal nerves. The side effects of completing the augmentations vary, as the subject's brain relearns how to move his or her body with faster reflexes and stronger muscles. The subject may experience neurological confusion such as falling over, exaggerated reflexes, and problems grabbing or holding onto an object. The subject may experience bleeding from the eyes, constant headaches, and aches in the bones. Due to the risky and dangerous nature of the augmentation procedures, many of the fourteen-year-old candidates died or "washed out" as their bodies rejected the modifications being made. Rather than be buried or cremated, the bodies of the deceased were cryogenically preserved with the hopes of one day reviving these candidates. Experimental rehabilitation programs were performed on more than 80% of the washouts, who had suffered varying degrees of disease, injury and deformity. The result of these programs, however, has yet to be determined. The augmentation procedures performed on the SPARTAN-IIs paved the way for a set of improved procedures known as Project CHRYSANTHEMUM for the Spartan-IIIs. Dr. Halsey: "Then they are faster and stronger than we anticipated?" CPO Mendez: "That would be understating the situation." — Franklin Mendez's assessment of the Spartans' capabilities following their recovery from the augmentations. John-117, age 14, awake after his augmentation procedures. The results of the augmentations on the successful candidates were unprecedented; the SPARTAN-IIs performed well beyond the projected capabilities. Dr. Halsey suspected this to be due to inexplicable, synergistic effects resulting from all the augmentations acting in concert. Combined with the Spartans' intelligence, seamless teamwork and unyielding drive for success, the augmentations made them nearly unstoppable against any conventional combatant. Chief Petty Officer Franklin Mendez stated that after the augmentations the Spartans would only get better as they adjusted to the changes. Therefore many of the Spartans' attributes have increased through time and acclimation. The SPARTAN-IIs were capable of lifting at least three times their body weight without the aid of their MJOLNIR Powered Assault Armor[note 3] when they were 14 years old. During their initial exercises in Reach's titanium mines, after recovering from the augmentations, the Spartans completely overpowered trainers wearing Mark I exoskeletons, outrunning their automated targeting systems and dismantling the heavy combat suits with their bare hands. A kick by John-117 flung one of the exoskeleton-clad men eight meters. Despite the carbide ceramic ossification rendering the Spartan-IIs' bones "virtually unbreakable", they can still be broken by extreme physical trauma. Examples of this include Kurt-051's ribs being broken by a Hunter's shield strike, Otto-031 breaking his ankle upon falling from a great height, and Douglas-042's left shoulder being broken by Atriox. Their reaction time, while impossible to chart accurately, was estimated to be twenty milliseconds. The Spartans' reaction times were noted to be significantly faster in combat situations or with assistance from an AI. The reaction times of the SPARTAN-IIs were so fast that they, in heightened states of stress, were able to think, react and see things as if everything around them were simultaneously occurring at both a slow and rapid pace - a phenomenon dubbed "SPARTAN Time" by Kelly-087. The motion of a Spartan in combat is nearly impossible for an outsider to follow, their movement appearing as a blur. These reflexes allowed Spartans to successfully dodge gunfire on certain occasions. SPARTAN-IIs are also known for their sharp eyesight, their occipital capillary reversal allowing them to virtually see in the dark. When wearing MJOLNIR armor, a Spartan's strength is boosted significantly. During the Battle of the Rubble in 2535, Adriana-111, while clad in Mark IV armor, used her enhanced strength to lift a 1077 kilogram (2370lb)[note 4] Mongoose by the handle bars and ram several Grunts with it. She followed up her maneuver by using the Mongoose as an improvised hammer, smashing three Grunts into the ground, pulverizing them into "explosions of purple blood", until the ATV's "..wheels had all bounced off, the chassis warped, and finally snapped". During the Battle of the Etran Harborage, the three members of Red Team (Jerome-092, Alice-130, and Douglas-042) defeated a force of over twenty Stealth Sangheili in close-quarters combat without sustaining any injuries themselves..
A MJOLNIR-clad Cal-141 was capable of blocking a Jiralhanae Chieftain's gravity hammer swing with a single hand, dodging multiple swings from the Brute, using her enhanced strength to jump to great heights, and wounding the Chieftain with a few punches and kicks. As he was trying to delete Gamma Station's navigation data during the Fall of Reach, a MJOLNIR clad John-117 physically stalemated a Sangheili in a zero-g grapple and wrestled it for control over a plasma pistol; he successfully killed it by striking it in the face with his elbow and shooting it with the plasma pistol. 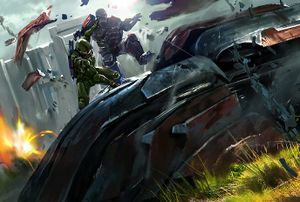 [note 5] During the Battle of Installation 04, a 41 year old MJOLNIR armored John-117 flipped a Warthog and later broke the skull of a Sangheili soldier with his fist, after it was weakened by a grenade. While trying to secure the space elevator in Havana during the Battle for Earth, Fred-104 clad in MJOLNIR Mark VI, fought and killed a Jiralhanae warrior in close quarters combat with a well placed strike to the Jiralhanae's neck and the entire clip from his rifle. During the Battle Of Onyx, Will-043 engaged a Hunter pair in hand to hand combat, and succeeded in killing one by ripping the worms out of its body, after Linda-058 bruised its mid-section with her sniper rifle. In the same battle, Kelly-087 engaged three Sangheili in hand-to-hand combat, snapping the wrist of one Elite, taking his energy sword, and cutting two more in half with a single swing. The nigh-unparalleled physical performance a Spartan can muster has even been utilized to board or neutralize heavily armoured enemy vehicles, including tanks. In 2553, during the boarding of the Piety, Naomi-010, while clad in Mark VII armor, defeated a Jiralhanae with a single uppercut, breaking its spine in the process. During Operation: JOVIAN WHISTLE, Fred-104 successfully struck an Aggressor Sentinel to the ground and physically stalemated the drone as it started to push him around. In 2559, during Second Ark Conflict, a self-standing Jerome-092 defeated numerous Jiralhanae and Sangheili inside the Enduring Conviction. He was able to hold a Jiralhanae Warlord's jaw and pull the Chieftain to the ground despite its weight, while uppercutting another Jiralhanae with his shotgun; single-handedly launching the enemy several meters away.. Fostering this accomplishment, Spartan-IIs donning Mjolnir have in many instances been shown as capable of throwing armored Jiralhanae from their vehicles. Three discharged Spartans have had the effects of their augmentations reduced through unknown means. Of these, Serin-019 and Ralph-103 were maimed by the procedures. Serin was declared dead and was secretly incorporated into the Office of Naval Intelligence, who reversed the physical damage she had suffered. She stood 6' 3" (191 cm) tall in her mid-forties, though whether this was due to the lingering effects of the catalytic thyroid implant or her own genetics is unclear. Ralph was discharged from the program due to a combination of psychological trauma and biological rejection of the various implants; his augmentations were likewise partially negated, leaving him physically inferior to the successfully augmented Spartans but superior to ordinary humans. He was allowed to return to civilian life and joined the Marine Corps by the age of twenty. Randall-037 emerged from the augmentation procedures unscathed and served on the frontlines until he went missing in action in 2532. When ONI discovered Randall in 2546, he accepted their offer to have his enhancements suppressed in exchange for being allowed to remain a civilian. The process was particularly excruciating. Ultimately he came to be much shorter than other Spartans and had some scars from the procedures to reverse the augmentations. ↑ In Halo: The Fall of Reach, Nylund states that the muscular enhancement injections decrease lactase recovery time. Lactase is a metabolic enzyme which catalyses the breakdown of lactose. A similarly named molecule, lactate (the conjugate base of lactic acid), builds up during anaerobic respiration in muscle tissue, causing pain after lengthy periods of exercise. It is lactate (not lactose) which is recovered during metabolism, therefore implying either a simple "s" for "t" typo during writing or an oversight in scientific language. ↑ It's unclear whether or not John ran at this speed under the use of his own power or through the use of MJOLNIR armor. Seeing as MJOLNIR has never been directly shown to automatically increase the sprint speed of a Spartan without the assistance of an outside source. It's possible that a highly sophisticated AI, such as Cortana, acted as a surrogate sprint module and allowed John's MJOLNIR to amplify his sprint speed for a short period of time. ↑ It is unknown as to what muscle groups were focused in this particular outlook. Had this been in the discipline of a bicep curl, a 3x coefficient would be considerably superhuman, and more aligned with their subsequent feats of physical strength in the excerpt. ↑ This is the GVWR, or Gross Vehicle Weight Rating, of the M274 Mongoose seen in Halo 3. ↑ The rank of the aforementioned Sangheili is not known. However, page 365 of the Definitive Edition of Halo: the Fall of Reach seems to imply that the Elite was a Minor or a Ranger by likening the color of its armor to the hull plating of Covenant ships. ↑ The exact conditions of the shots that Linda took on those two Banshee pilots are unclear. It's possible that Linda took the shots on those Banshees with their cockpits opened up, since page 321 of Halo First Strike states that, "The Chief craned his head back and saw the pilot of the lead Banshee slump, slide off the flier, and plummet to the ground. The trailing Banshee was riderless as well... only a blood-spattered cockpit and cowling." It would seem likely that Chief would not be able to see the "pilot of the lead banshee slump" or a Blood stain large enough to be visible in the cockpit unless the banshees cowlings were open even before they were shot down by Linda. Illustration of augmented skeletal muscle. Illustration of the Carbide Ceramic Ossification. Illustration of the Catalytic Thyroid Implant. Illustration of the rods and cones of the human eye. Illustration of the human nerve cell. An illustration showing the arm before augmentation and after. John-117 undergoing the augmentation procedures in Halo: Fall of Reach. John-117 after going through the augmentation procedures. A scan of John-117's brain during the augmentation procedures. Detail of the surgical scars on the forearms of a SPARTAN-II, in this case John-117. Catherine Halsey overlooks her Spartans as they undergo their augmentations. A 14 year old John-117 benching 495 lbs. after augmentations. ↑ Halo Wars 2, multiplayer map Bedrock Phoenix Log "..the Ghost and its new rider were deployed to the Ark where it fought in the climactic battle of the Human-Covenant war - this time piloted by a veteran Jiralhanae warrior. However, despite the Ghost pilot's combat experience he was unprepared for the Demon, who surprised the Brute from nowhere and threw his body from the vehicle."